American Comics Group was a small publisher, and may be most notable for the fact that it was never merged with or purchased by Marvel or DC. They lasted from 1943 to 1967, and so are a strict relic of the Golden and Silver Ages. No long-running characters from ACG have survived in our cultural consciousness, probably because they focused almost exclusively on humor and horror anthology titles. Still, their history is interesting, and the horror titles, especially, are quite often wonderful surprises. Adventures Into the Unknown was the first title exclusively dedicated to the horror genre in the Golden Age, although its start in the later Golden Age (Fall, 1948) and its finish solidly within the Silver Age (August, 1967) means that this comic's nearly 20-year run falls somewhat in between worlds. Adventures Into the Unknown would go on to become ACG's flagship comic, and is what the company is chiefly remembered for today. Somehow, this title weathered the storm that the Comics Code Authority hurled at the horror industry in the mid-50s, adjusting their content slightly to meet the code, and continuing undaunted. Adventures Into the Unknown had always been more oriented towards gothic horror and ghost stories rather than the gory material of some of American Comics Group's competitors. 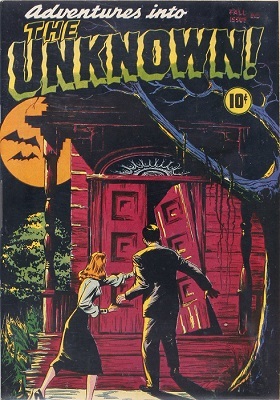 Adventures Into the Unknown #1 appeared in Fall of 1948, with cover art by Edvard Moritz, depicting a classic Golden Age haunted-house style illustration, and included an early horror story by author Frank Belknap Long, later to become significantly more famous. This comic is scarce, and desirable to collectors, with prices that can enter four figures in top condition. 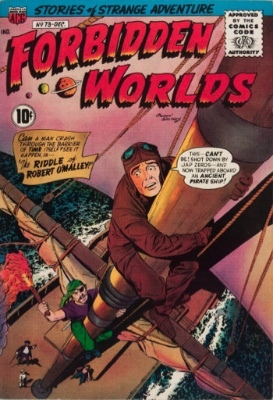 Forbidden Worlds #1 appeared on newsstands marked July/August 1951, and was a companion series of sorts to Adventures Into the Unknown. At first, it had the subtitle, "Exploring the Supernatural!" In 1954, the congressional hearings in the wake of SOTI brought about a 3-month name change to "Young Heroes," but in late 1955, Forbidden Worlds was back to its old title, with the new subtitle, "Stories of Strange Adventure." 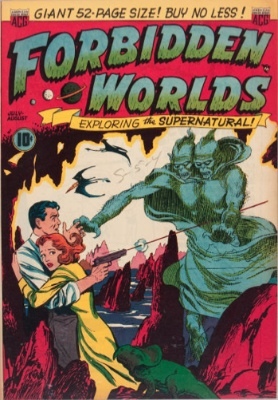 But in 1951, the need for distance from anything supernatural was not even a gleam in Fredric Wertham's eye, and FW#1 was a marvelous example of the science-fiction/horror/mystery anthology style, with a Frank Frazetta cover. In good shape, copies of FW#1 can fetch quite a nice price. By the time Forbidden Worlds #73 appeared in the post-SOTI world of 1958, humor was a regular component of ACG titles. This issue of Forbidden Worlds introduced a young man named Herbie Popnecker, who must be read to be understood. Perhaps the best way to explain Herbie is to say he is one part Zen Master, one part Captain Marvel, and one part Alfred E. Newman. That description might begin to scratch the surface of Herbie. Herbie's story in this issue is illustrated by his creator, the tireless Ogden Whitney, and is a lesser key issue as far as American Comics Group collectors are concerned. Still, it is relatively scarce in good condition, and the best copies will do well at auction. Aside from Adventures Into the Unknown, Herbie Popnecker was the most valuable property American Comics Group had. He was spun off into his own comic in April of 1964, with Herbie #1, which ran bimonthly (or so) until the company closed its doors in 1967. Herbie ran for 20 issues in all, and each one is a real goldmine, in terms of humor and strangeness value, if not in dollars. 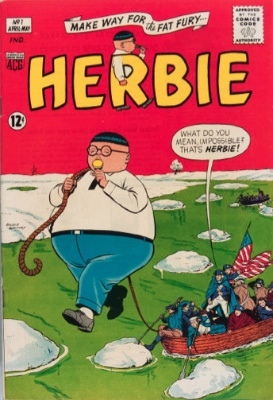 The genuinely unique weirdness of Herbie was a tremendous influence on the relatively small number of readers it reached. Many of the comedy writers who worked at the Harvard Lampoon in the 1960s and the National Lampoon in the early 1970s had been reading Herbie for years. Herbie #1 is an early Silver Age issue of a relatively unpopular humor comic published by a second-tier comics company. 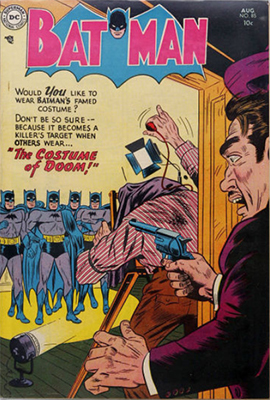 It's never going to sell for as much as Detective Comics #27, but that doesn't mean it's valueless. Most copies of this and other issues of Herbie are still reasonably-priced, but will sell for more in top condition. One of these days, the right person will read a Herbie compilation, and he'll come back in style, and the value of these will go through the roof. Founded in 1943 by Benjamin Sangor, ACG began under the name "Creston Publishing" with several titles in the so-called "funny animals" genre in the fall of that year. Teenage comedy titles followed, including an Archie Comics knock-off ("Cookie") and a Blondie knock-off ("The Kilroys") shortly after the war. By 1948, Fred Iger came on board as co-owner, the name was changed to American Comics Group, and some new titles were launched as part of the company's new direction. While they still tended to stay away from superhero comics, the newly-named ACG innovated the horror anthology comic with Adventures Into the Unknown (click for full price guide) that same year, and with Forbidden Worlds, added three years later in 1951. 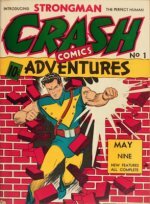 Adventure titles followed, such as Commander Battle and the Atomic Sub, and The Hooded Horseman, but the advent of the Comics Code hit ACG hard, as it hit every comic publisher. A general decline in comic sales prompted ACG to drop most of their series except the horror anthologies, which were prompted by the Code to tone down their content considerably, often substituting ironic humor for grisly gore. The more teenage, sarcastic type of humor, as exemplified by MAD Magazine, came to the fore in ACG's late-50s title Herbie, which starred Herbie Popnecker, an overweight, inept and acne-ridden teenager who found himself in various bizarre situations. He occasionally fought crime, wearing a helmet made out of a toilet plunger (!) as, we kid you not, The Fat Fury. Herbie may be the most well-remebered ACG character, as odd as that seems. 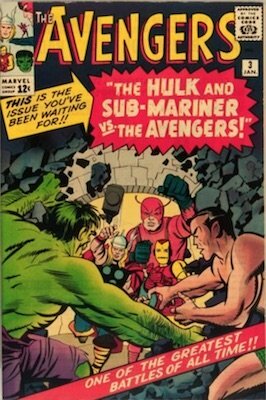 The resurgence of superhero comics in the 60s, as the Silver Age dawned, prompted ACG to finally dip its toe into those waters, with undistinguished results. Titles like Nemesis and Magicman didn't last long, and didn't make much of an impression on the public. By 1967, the superhero comics were gone, and the sales of Adventures Into the Unknown couldn't keep the company afloat any longer. They folded, and the story pretty much ends there. None of the characters or titles has ever been revived in any major way. This may be good for collectors, though, since most ACG titles are not well-known, and therefore "fly under the radar." 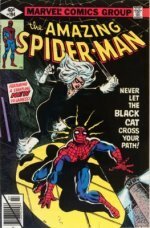 Have Your Golden and Silver Age American Comics Group Comics Valued! If you've got some old American Comics Group Comics, (especially issues of Adventures Into the Unknown and Herbie), then click here to have them valued FREE by Sell My Comic Books! From the early roots of Timely Comics into the Silver Age and beyond, find out the values of Captain America, The Avengers, Fantastic Four, Spider-Man, and many more. From the dawn of the Golden Age into the Bronze Age, we cover all the major superheroes, and help you to identify which issues are worth the most money, if you have some. 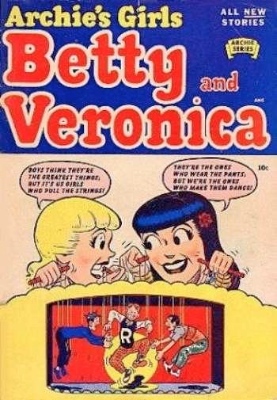 Learn the value of early and key issues featuring Archie, Jughead, Betty, Veronica, and all the rest of the crew, and find out how to sell yours if you want to cash in.